With pleasure, we are proud to announce that Altiplan Gold has relocated to Texas where he will be joining us at Tierra Prometida Alpacas as part of our Star Herdsire lineup. A Peruvian Presidio daughter, Travesura also brings to the table the genetics of Peruvian Bueno. 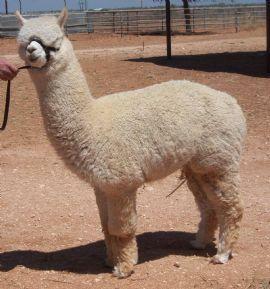 Travesura has consistently produced outstanding cria. SPECIAL FOR FALL 2014 - we have seriously dropped the price on Treasure's breeding fee for Fall 2014. 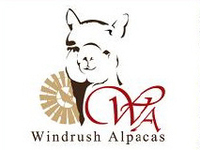 Usually $2,000 we are offering breedings to Treasure for $750 for a limited time. Grab your chance to get Treasure's genetics at this bargain price! Hot News! 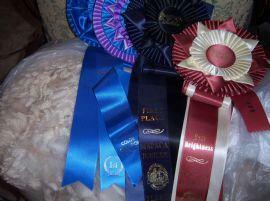 Oct 2011 Treasure's son Quantam Boogaloo of LSA cleaned up the ribbons & banners at the Gold Country Gathering in CA-Color Champion & First Place in halter, Reserve Color Champion & First in Fleece! Treasure is putting his stamp on all he produces - amazing bundled bright fleece, solid compact confirmation, stylish head and heavy bone are consistently appearing in Treasure's cria. Book your breeding today! Treasure is an exceptional male and a handsome stud. Compact body style, heavy boned, with the stylish head the judges are looking for. Add to that his correct bite on top of his amazing fleece and you've got one great package. 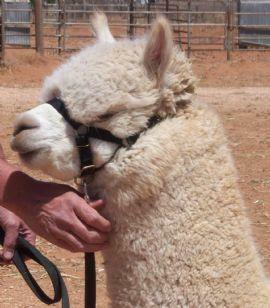 He has won 2 Reserve Color Championships in halter, and a Color Championship for his fleece. Treasure's offspring are now on the ground and are consistently imprinted with Treasure's qualities. 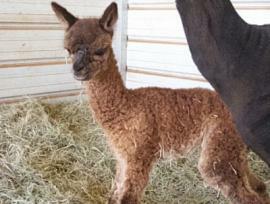 Ranging in color from brown through fawn to snowy bright white, these cria are exceptional like their sire.